The new Cat Blogosphere Calendar of Cats came out a few weeks ago and, since we are in it this year, I couldn’t not order it. It arrived just before we went on vacation so I didn’t have a chance to look at it until this weekend. I’m not a very organised person, which isn’t good for a blogger. I don’t write too many things down and some of my ideas for post get forgotten. I even forgot to post about Chris’s Gotcha Day last month. My original thought was that this Calendar would be a novelty and it would end up lost in a drawer but I think that I could actually find a use for it. My first thought was that I could write down all the national cat days that seem to pass me by unnoticed until it’s too late. As I flipped through the calendar however, I noticed many of those days are already in there. I just have to write down things like Chris’s Gotcha Day. This calendar was designed by Paula Gregg of Sweet Purrfections and Debbie Glovatsky of Glogirly desiged the cover. It is set up like a weekly planner and we are located at the end of June. There are many of my blogging friends in this calendar as well but the list is long and I don’t want to mention some while leaving others out. There are also some blogs I have not heard of but need to check out. 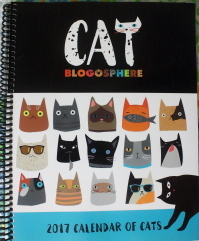 If you want to order your own Cat Blogosphere Calendar, you can get it here. If you prefer monthly calendars, check out my post here. Hopefully 2017 will be a great year for all of us. 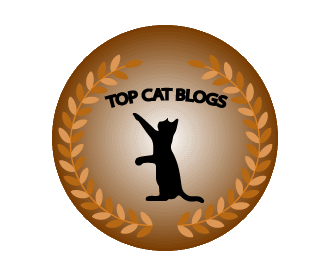 This entry was posted in Uncategorized and tagged calendar, cat blogosphere, Cats, national days, organized on December 19, 2016 by Charles Huss. Will you use it for blogging? We made the big leagues now. Hahaha. It is both cute and useful. It must be fun to be famous! You kids are looking good! It’s great except for the poperatzi. 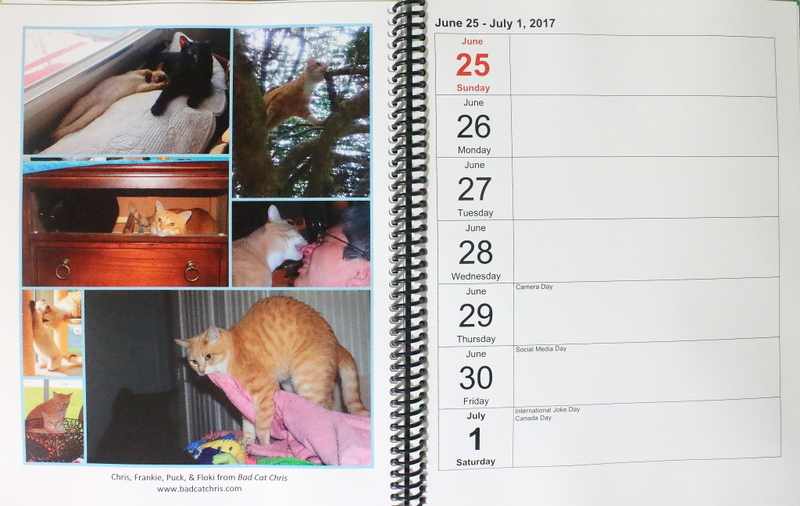 The Critters in the Cottage human had the Cat Blogosphere calendar, and my human got to check it out when we visited them – it’s very nice! We are there too!! We promoted it BIG TIME before it came out………..haven’t promoted it yet after we got it………….love seeing all of our friends there! I agree. I like seeing Cody and some of my other feline friends on the pages.